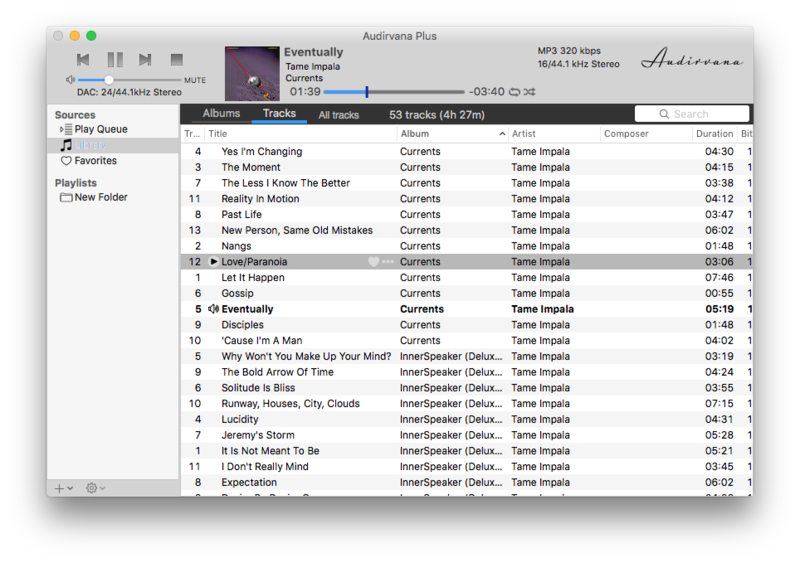 When it comes to a Mac music player, users are often confused. That's because, for some reason, most players look like iTunes but with a broader functionality and the absence of iTunes store. We need an iTunes alternative because we want to listen to audio formats not supported by it. Today, I'm comparing to prominent audio players for Mac – VOX Music Player and Audirvana according to their functionality, compatibility, format support, interface and additional features. The player looks just like iTunes. The main functions are usual: play music, create playlists and adjust sound preferences. What I didn't like is that Audirvana uses iTunes's system of adding music to the library – synchronization. It's really strange not to be able just to drop files to the player. No, you have to go to settings, choose a folder for import and then sync it. Inconvenient. Users can connect Audirvana to TIDAL, Qubuz, and HighResAudio Virtual Vault. It will allow streaming from those services. VOX is all about playback. The app puts an accent on simplicity so that users don't get confused with how to use the app. VOX includes only five tabs: Playlist, Library, Queue, Radio, and SoundCloud. 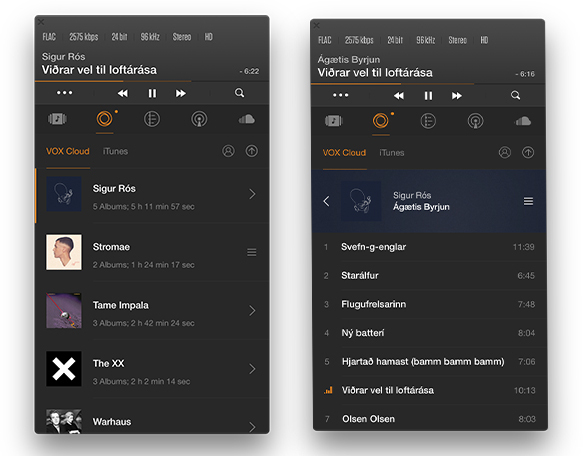 Users can log into Spotify, and SoundCloud to listen to their music library using one app. Last.fm scrobbling available to keep the listening stats and get recommendations based on played tracks on VOX. The Radio includes 30,000 stations from 140 countries. Audirvana works only with macOS. A+ Remote is an iOS app that allows you to control the Mac player using your iPhone. 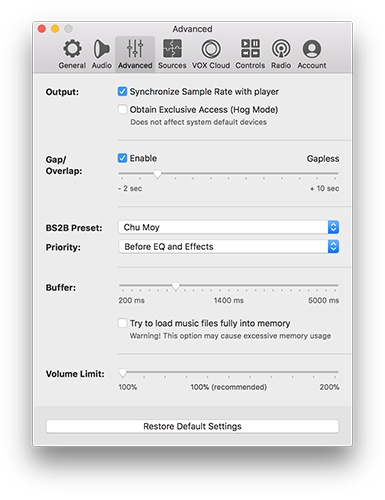 VOX Music Player has a macOS and iOS version. The functionality of desktop and mobile is pretty much the same. According to VOX developers, Window and Android versions are due in 2018. Both players support uncompressed, lossless, and lossy audio formats. They include AIFF, ALAC, FLAC, WAV, DSD, MP3, OGG, APE, playlist formats and more. Apart from that, there's an online storage for your music. It's called VOX Music Cloud. The cloud serves as the main place to keep your music and stream from it to your devices. 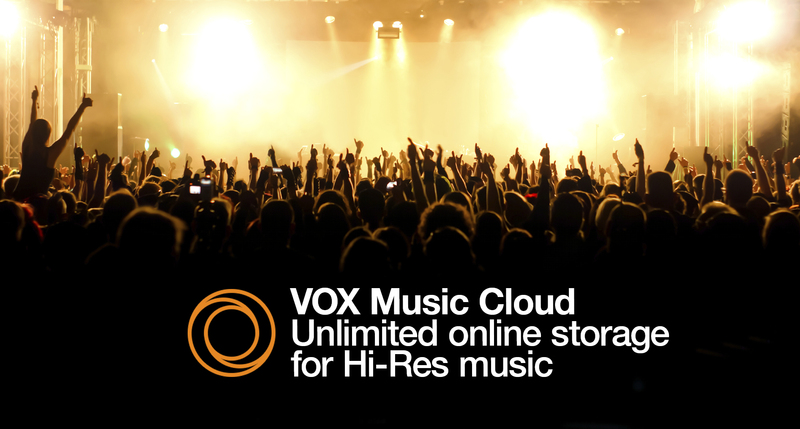 VOX Music Cloud is an unlimited online storage. You can upload there as much music as you want. It also has no restrictions on audio formats or file's size. If your upload thousands of FLACs, it's fine. You can listen to them on your iPhone and Mac. VOX Music Cloud is available only to VOX Premium subscribers. Now that we've learned about these players, you can try any of them and see how it goes. I prefer VOX Music Player because it's easier to navigate and use in general. 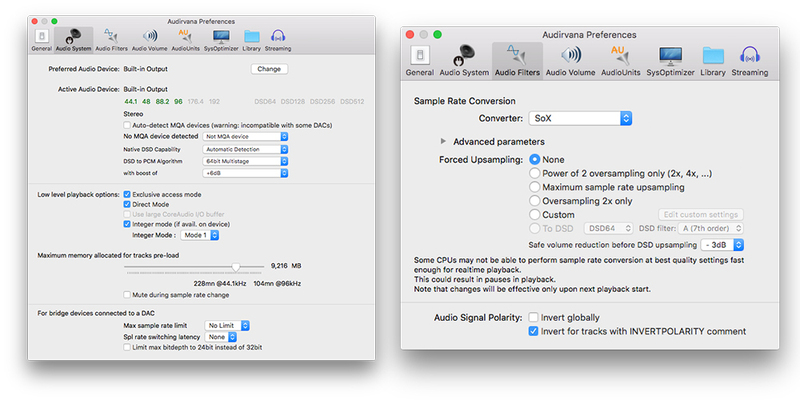 Audirvana would suit best for audio engineers and audiophile who know things about sound equalization. But I'm not one of them.